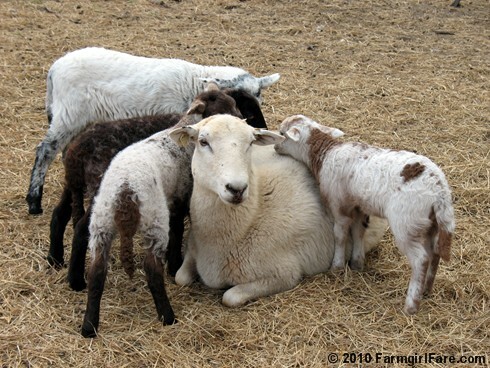 Farmgirl Fare: Friday Dose of Cute: Surrounded! 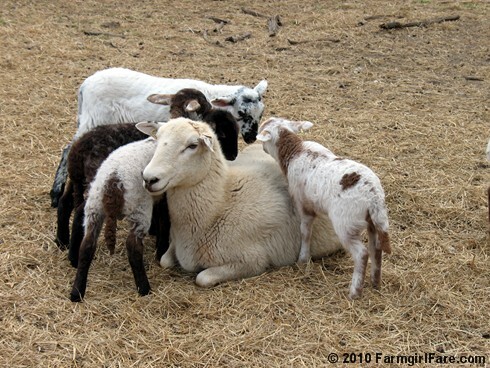 Only two of these lambs are hers, and what's really amusing is that the little Katahdin who kept trying to climb on top of her isn't one of them. Two years ago, we added a Katahdin ram and two Katahdin ewes to our flock, in the hopes of building up the parasite resistance in our mostly Suffolk sheep (they're the ones with the distinctive black faces and legs). So far it's going really well, and we're very happy with our hair sheep. © Copyright 2010 FarmgirlFare.com, the finally getting some rain (yay!) foodie farm blog where not long ago I found out that I grew up in one of the few places in the U.S. that doesn't regularly get thunderstorms, and 15 years after moving to Missouri—where a quiet rainfall feels like a rarity—I kind of love them, but at the same time they still tend to scare me just a little. 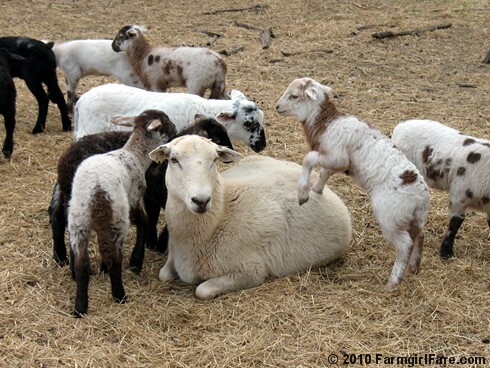 Lamb babysitter? Do all the other ewes go partying in the grass, while this poor girl is saddled with all the responsibility? Obviously a wonderful mama! Those lambs are so adorable. Read that you got rain yesterday, hope you did not get the horrible weather today. Sounds like it was nasty tornado weather. Take care. LOL. Could also be called "Attack of the Babies". Just love all your photos!